What Is the Best Fabrication Method for Z-Sections? Have you ever been inside a facility and noticed long metal beams across the ceilings and walls? Z-sections are common structural components used for support. These steel struts are typically roll formed because they are used in construction, transportation and manufacturing industries where accurate dimensions are required. This post was originally published on April 15, 2015. Should you press brake or roll form? It’s a big decision with multiple factors to consider. Ultimately, the decision comes down to what fabrication method will yield the desired quality for the lowest overall cost. What you don’t know could be costing you half a million dollars each year. Chamberlain had been making the straight and curved arms in its garage door design the same way for years. But section modulus studies and finite element analysis revealed opportunities to cut material content—by 55%. Chances are, you’re not hard-pressed to find a metal fabricator that offers the capabilities and services to fit your needs. But what other qualities should you look for in a metal fabrication partner? What sets a company apart from the rest? Below are five characteristics to help you distinguish a competent fabricator from an exceptional metal fabrication partner. How and Why Should I Design for Metal C-Beams? When it comes time to reducing production costs or increasing profit margins in metal product manufacturing, the responsibility may fall to the manufacturer’s engineering team to determine how best to cut product costs without sacrificing quality and structural integrity. Struggling to stretch the budget for your next metal fabrication project? We get it. It’s expensive, between the cost of tooling, labor and sheet metal. There’s a lot of pressure to keep costs down and ROI high. Your choice of a metal fabricator could be the solution to decreasing your metal fabrication costs while retaining a high-quality product. Below are four ways your metal fabricator can lower your costs, contribute to sales growth, improve profit margins and optimize your cash flow. If you choose the right partner, that is. Which Metal Fabrication Process Will Optimize Production Volume? In an uncertain market, balancing your inventory is critical. And when forecasting is a challenge, you need to place more of a focus on keeping production costs low without sacrificing quality. One of the first things to consider is the volume of the project. Whether your project requires a high or low volume run, you have options as to what metal fabrication process will produce the most efficient returns. Below we discuss the factors you must weigh when choosing between metal forming processes for the expected production volume. With any new metal fabrication project comes plenty of planning, challenges, critical decisions and efficiencies to strive for. Before you budget your next fabrication project, it’s important that you have a full grasp on the different manufacturing factors to consider, and how you can optimize each step of the process for cost reduction, timeliness and efficacy. The first step to solve any problem is to identify what’s wrong. Evaluation is an important step in the problem-solving process. 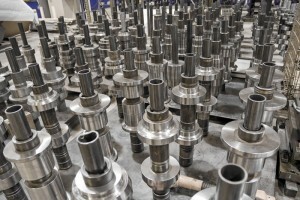 Through proactive evaluation, design engineers can identify where material can be reduced, in-line processes consolidated and assembly costs cut. Once you identify the cost savings, you can develop the right metal fabrication solution. When You Decide on Metal Fabrication, Who’s Seated at the Table? The same sentiment can be shared regarding big decisions in your company— such as fabricating a metal component. Depending on the size and organizational structure of your business, there are a few key stakeholders who should be involved in every metal fabrication meeting. Below are the people whose input should be considered when evaluating production options.